i Went to whistler! first time! Discussion in 'Downhill & Freeride' started by The_Olympia_Guy, Aug 31, 2005. 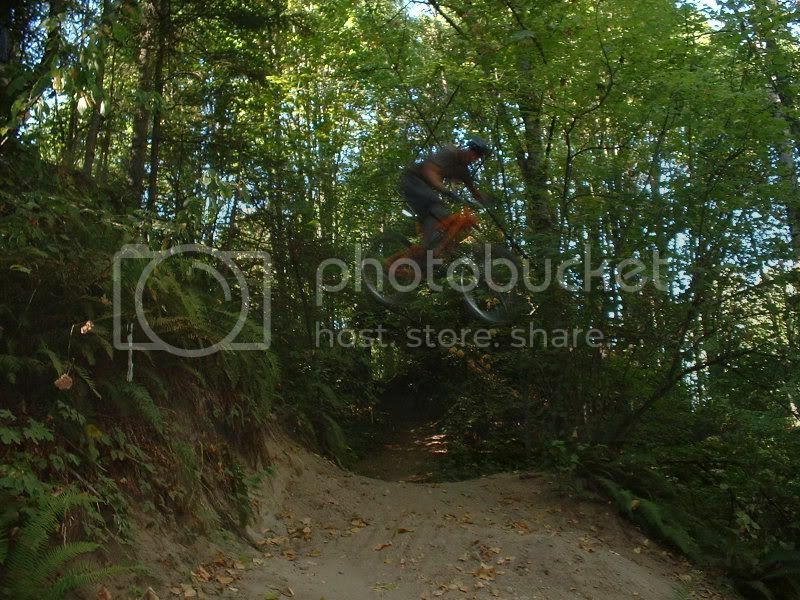 So, a friend of mine got me into bikes recently, i had a full sus, Giant warp, went down capitol forest here in wa, and dam near broke the brike, so i went and got my first real bike, TREK, session77 and my buddy took me with him to whistler! repeated over and over, till i started clearing most all the jumps. sunday we went to the very top and took no joke, and frieght train.. im glad i got the session cause the giant wouldent have cut it. CRAZY FUN! but for my first trip. i loved it and im hooked! !, wonderful town AWSEOM riding,. just so much fun i cant wait to go back, and the crazy cad we followed sed he dident mean to take me down those trails but he sed he was suprized i did stay on the bike lol.! crazy fun and i am going on the shuttle this sunday to capito forest ! so maybe il see some of you there! I was there all of last week with a bunch of friends from the DC area. Good times and perfect weather. This year I think my favorite run was No Joke/Freight Train down to Dirt Merchant and Lower A-Line. A close second was Original Sin-Goats Gully-In Deep to Fatcrobat to D1 or Too Tight to [insert favorite trail on lower part of the mountain]. This year I think I started most of my runs from Garbanzo and surprisingly never did a complete run down all of A-Line considering I spent an entire extended play session last year lapping it out. I'll be posting more pics soon. Great to hear you had a good time. I'm planning a trip there next summer. I was there all of last week with a bunch of friends from the DC area. Yo D, Farris here. Hope you guys made it back OK. We did, but I know there's at least two kids from Whistler who will never hitchhike again. I was also hoping to could get the rest of those photos off you. I'd sen you my email, but your PMs are full. Plus I want full rez. I'll send you a CD of our stuff too, if only so you can show people what you had to put up with for a week. Poppa bear here, what did you guys end up doing for the weekend? You guys ride the shore afterwards, then hit up Seattle? We hit up Seymor it was pretty dope! We skipped the Shore. I was pretty Shore-ed out after my last trip, especially Seymour (we wnet with Johnny Smoke and that's his stomping ground). I would've been down to ride Cypress (not the bike park), but would've wanted a local to ride/shuttle with us. 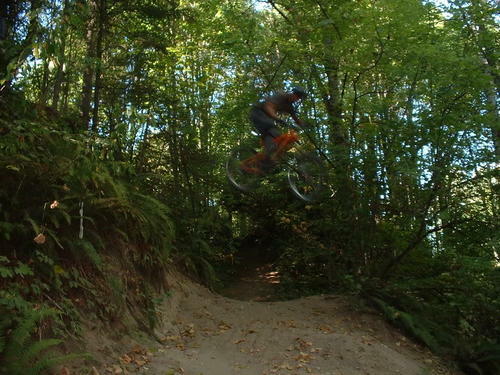 Wild Cherry and Fifth Horseman are some of the burliest classic DH trails out there. Skipping the Shore worked out ok, since we got detained at the border. After that we rolled back to Seattle and sessioned SST. Gordo on the big drop. Should have some more media soon. Oh and D, I'm not home yet and too lazy to hit you up via web portal; expect an email some time tomorrow. BTW, that knife trade CD friggin rocks! Thanks for the hookup. hey, this is damon. We rode in cap a few weeks back, i was on the Turner DHR. Glad to see you guys had a fun time. I wish i could have taken jody up on that offer for floor space, but couldnt get up there. Good to hear your getting the bug. Oh yea! Glad i made it out there also. That place was fun, and ive got some work to do to get up to speed on the jumps..... Maybe this weekends rain will make it good for next week if we can work that out?? Sunday shuttles dont really work for me anymore, my paintball team has practice but I have a rack that holds two bikes and could probably shove a third in the back if we removed a wheel...shuttle!? Would also be fun if we got a lot of us for an Oly night out or something and all shuttled Cap. and yea, give greg a call, his place is kilelr! Hey guys I can haul a few bikes too, if people want to do some shuttles on saturdays. I remember almost weekly shuttle and trail rides out in cap back in the day. It is really a nice place to ride.